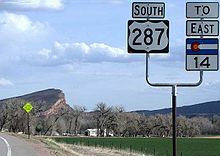 U.S. Route 287 (US 287) is a north–south (physically northwest–southeast) United States highway. It is 1,791 miles (2,882 km) long. [ citation needed] It serves as the major truck route between Fort Worth and Amarillo, Texas, and between Fort Collins, Colorado, and Laramie, Wyoming. 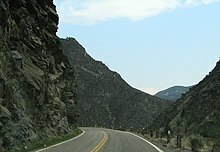 The highway is broken into two segments by Yellowstone National Park, where an unnumbered park road serves as a connector. US 287 is the shortest route between Denver and Dallas- Fort Worth. US 287 originates at its southern terminus in Port Arthur as a branch of SH 87. From Port Arthur, US 287 runs concurrently with US 69 and US 96 to Lumberton, where US 96 diverges to the northeast and the co-signed US 287/US 69 continues northwesterly until US 287 and US 69 diverge in Woodville. Continuing northwesterly, US 287 merges with Interstate 45 (I-45) in Corsicana and follows the Interstate to Ennis, where it branches off and continues through Waxahachie, crossing I-35E and continuing north through Tarrant County, where it encounters and briefly merges with three different Interstates ( I-820, I-20, and I-35W). From Fort Worth, US 287 continues north to Wichita Falls and continues just south of the Oklahoma border before entering the Texas Panhandle. A section of US 287, between Midlothian and Waxahachie, was dedicated as the Chris Kyle Memorial Highway, in honor of fallen SEAL Chris Kyle, whose hometown was Midlothian.